Physical activity is very important for the health of every man. People that perform any kind of exercises during life suffer less from back issues, overweight and cardiac diseases. It would be the best if people would perform exercises from an early age until the end. Of course, different people should have different exercises. It should depend from type of person. Some issues could be treated with some exercises as well, so it is more than recommended to find the best exercises for you. Some of the most common exercise would be mentioned in the following lines, so maybe some of these would be best for you. Different exercises are used to different causes; some exercises are used to improve your muscles, some of these are good for stretching, and some can be good for back issues. Usually, all type of exercises can be split in to the three categories, and those are aerobic exercises, strength condition exercises and exercises for muscle and ligament flexibility. It is the best if all three types are included in your everyday exercise. Stretching is very important on the beginning of exercise, so your muscle could be well prepared for the rest of the tasks. So, whichever exercises you have chosen, never skip the worm up! Any kind of exercises that include walking, running, rope, bicycle, swimming, skiing, climbing are aerobic exercise. Also the sports that include running like football, soccer, basketball, handball are also the type of aerobic exercises. In the title of aerobic you can recognize word air, so all these disciplines make that your organism to be filled with oxygen, especially muscles. 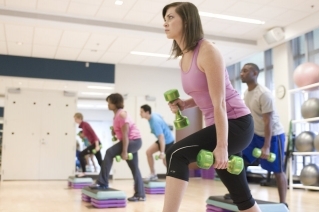 The most important muscle in the body is heart, so aerobic exercises improve heart work. Aerobic exercises are also great for lose weight and it is recommendable to be performed at least half an hour by the day. It is also good that you can arrange those thirty minutes whatever you like, as long as you have effective exercises. Those exercises are often in use among men, but of course among some women, too. Those exercises include weight lifting, and all other disciplines that make your muscles grow bigger and stronger. Strength-condition exercises are usually performing in gyms, by the special devices. Fortunately, it is not necessary to go to gym to do these kinds of exercises. You can simply do some exercises at home such as push-ups, sit-ups, or you can by some small weights and do some practice even if you are watching TV. When muscles get old, they are losing flexibility, so it is important to practice muscles even in the young ages. The best exercise for stretching is definitely yoga. It is very recommendable for professional sports, but also for all people. Yoga would keep your body in shape and also your mind. how long before I start losing inches with fitness aerobic? pilates exercise-did you see the difference?